* The United States Army was also once organized into regiments, but presently uses the brigade instead. There are exceptions, such as the United States Cavalry, some parachute infantry regiments and the Army Rangers. Although every battalion or squadron is associated with a regiment for historical purposes, most combat regiments are cavalry regiments which are attached to a corps. These regiments, who are associated generally for historical purposes, can be known as parent regiments. 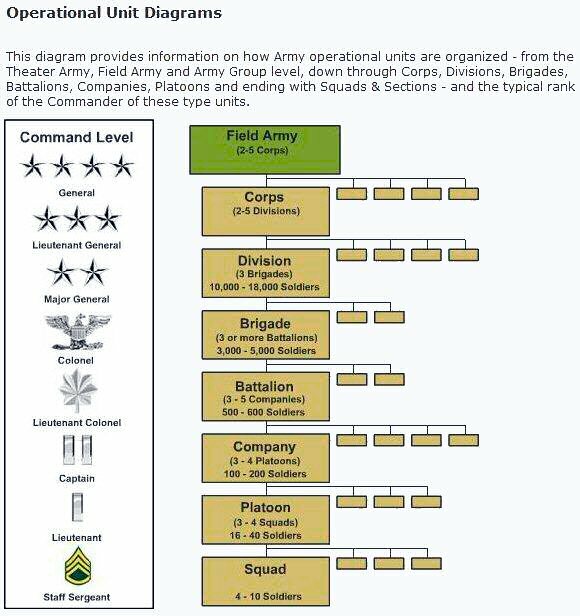 A brigade is smaller than a division and roughly equal to or a little larger than a regiment. Strength typically ranges from 1,500 to 3,500 personnel. Army brigades formerly contained two or more regiments, but this structure is now considered obsolete. A regiment is larger than a company and smaller than a division. Depending on mission and makeup, a modern regiment is similar to a brigade in size in that both range from a few hundred soldiers up to 2,000-3,000, depending on branch of service and method of organization. The modern unit varies in size, scope, administrative role from nation to nation, and within the armed forces of some nations. In the 20th century the "Division" became the tactical and administrative building block for U.S. armies in mobilizations for World Wars I & II, Korea, Vietnam and NATO. Training, administration and even tactical employment was centered at divisional level. Most combat support and logistics was also concentrated at that level. In the 21st century, the U.S. Army has moved to "modularization", trying to use the autonomous brigade as the basic building block, as well as insert more stability and unit cohesion. The United States Marine Corps calls its divisional brigades, regiments, for traditional reasons. Primary mission: The mission of the Army Ground Forces, as stated by War Department Circular 59 (2 March 1942) was "to provide ground force units properly organized, trained and equipped for combat operations." Commanders: Lt. Gen. Lesley J. McNair, March 1942-June 1944. Lt. Gen. Ben Lear, July 1944-December 1944. Gen. Joseph W. Stilwell, January 1945-May 1945, Gen. Jacob L. Devers, June 1945-. Chronology of events: The Army Ground Forces was established on 9 March 1942 as the successor to General Headquarters, United States Army (which see), pursuant to an Executive order of the President of 28 February 1942. On 10 March 1948 it wag redesignated the Army Field Forces, per Circular 64, Department of the Army, dated 10 March 1948, and is still active. 18 Feb 43: Combat Trps, Ledo Sec (APO 689), act with hq at Ledo, as a subordinate comd of Hq USAF CBI, with mission of protecting const of Ledo Road. 1 Feb 44: Combat Trps, Ledo Sec, discontd and units transferred to NCAC. 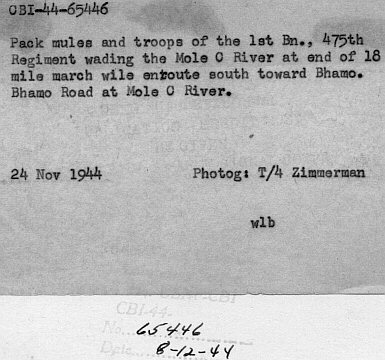 Effective 1 February 1944 NCAC vas organized with headquarters at the Mile 5.5 on the Ledo Road. The Commanding General, NCAC, was responsible for the supervision and direction of all special and service units (Anglo-American) placed in the NCAC, with the exception of SOS units specifically engaged in road construction and the necessary auxiliary and service units. The command of all combat troops in NCAC remained with the Commanding General, Chinese Army in India (CAI). 4 Oct 43: 5303d Hq and Hq Co (Prov) Combat trps org. 29 Jan 44: 5303d Hq and Hq Co (Prov) Combat Trps redesig 5303d Hq and Hq Co (Prov) Area Comd. 19 Jun 44: Hq and Hq Co NCAC (CT&CC) act. Pers allotment for NCAC was granted in order to provide American pers for Hq and Hq Co NCAC and to provide all liaison pers with units asgd to Chih Hui Pu (CAI), all American pers with units asgd to Seagrave Hospital Unit and 1st Tank Group, and American pers for such other activities as required them. 19 Jun 44: 5303d Hq and Hq Co (Prov) Combat Trps disbanded. 17 Jul 44: CG USAF CBI assumed direct contl of NCAC. All Allied units (except Chinese) atchd for opnl contl to NCAC. 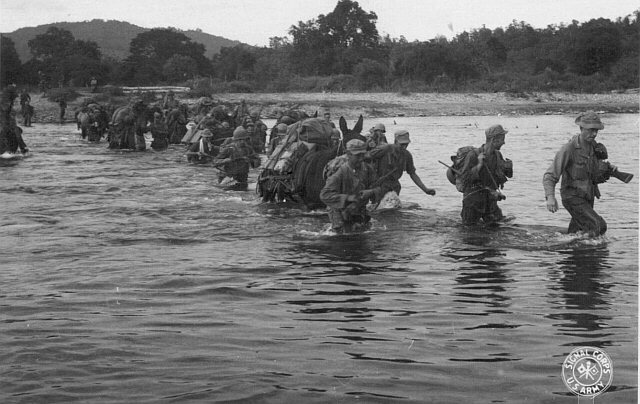 26 Jul 44: 5332d Brig (Prov), known as MARS Task Force, act 26 Jul 44 and asgd NCAC. Mission of 5332d Brig (Prov) was to comd long-range penetration units. 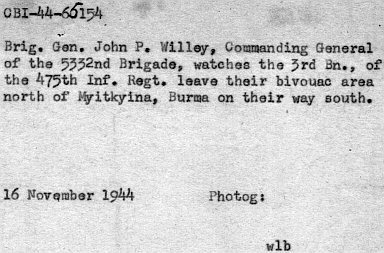 5332d Brig (Prov) participated in second battle for Burma. 10 Aug 44: 475th Inf act Ledo and asgd NCAC. 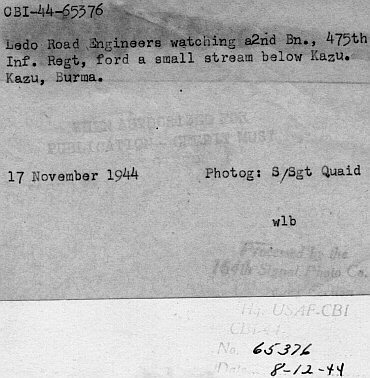 24 Oct 44: NCAC asgd to IBT. CG USAF IBT assumed comd of NCAC. 12 Nov 44: NCAC came under opnl contl of ALFSEA. 10 Jan 45: NCAC Fld Repl Depot established Ledo and asgd NCAC; discontinued 12 Apr 45. CG IBT announced opening of Ledo Road. From Mr. David Fisher: "My father was a marauder with the 5307th. He told me stories of how the men in that unit had copies of their outfit emblem handmade, prior to their having had one made by the military. I sent you two (photos) (ed: photos not displayed here for space issues), the first is the one on my father's uniform. Notice the star is on the upper left part of the lapel pin. The next is the first 5307th patch issued. The patch was later changed to reflect the sunburst on the upper left side, and the 5 point star was moved to the upper right side, with the lighting bolt. Later it was changed again to what you see today, with "Merrills Marauders" across the top. This was after they were taken over by the Mars Task Force. I have been told by the Institute of Heraldry that these items were only issued to the original volunteers of operation galahad." The symbolism of the patch is that the 5307th was made up of six "combat teams" named for colors�red, blue, white, green, khaki and orange. The patch has the first four colors and khaki was supposed to have been represented by the uniform itself. For some reason orange was left out. The white five-pointed star was for the Star of Burma and the white "sun" - actually the Kuomintang star � was for China. The red lightning bolt represents the striking power of the unit. 10 Oct 43: 5307th Comp Regt (Prov) organized at Deogarh, India. 1 Jan 43: 5307th Comp Regt (Prov) formally activated at Deolali, India, as subordinate command of Hq USAF CBI and redesignated 5307th Comp Unit (Prov) 2 Jan 44. (0/a) 5 Feb 44: 5307th Comp Unit (Prov) atchd to Chinese Army in India (CAI) and assumed further attached to Northern Combat Area Command (NCAC). 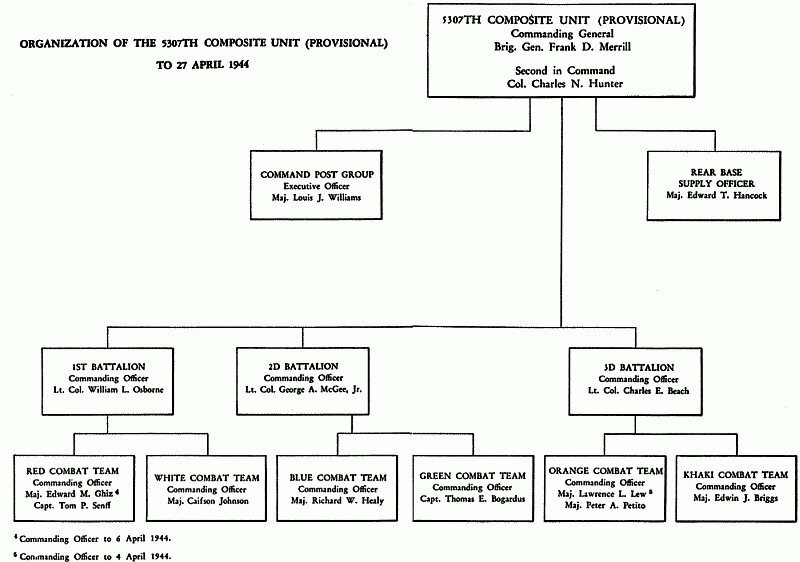 8 May 44: 5307th Comp Unit (Prov) assigned to NCAC. 10 Aug 44: 5307th Comp Unit (Prov) disbanded. Lineage: 10 Oct 43 organized at Deogarh, India as the 5307th Composite Regiment, Provisional, and activated 1 Jan 44 under U.S. Army Forces in China-Burma-India; 2 Jan 44 redesignated as the 5307th Composite Unit, Provisional, also known as GALAHAD Force and Merrill's Marauders; organized into three long-range penetration battalions and entered Hukawing Valley Burma on 12 Feb 44; assigned to the Northern Combat Area Command on 8 May 44 and operated behind Japanese front lines, capturing Myitkyina Airfield along the Irrawaddy river 17 May 44; 3d Bn defeated at Charpate 24 May 44 and 2nd Bn driven from Namkwi 26 May 44; battled at Myitkyina until captured city 3 Aug 44 where disbanded on 10 Aug 44 and assets transferred to 475th Infantry Regiment. Decorations: Distinguished Unit Citation, 3 Mar-17 May 44, WD GO 54-44. In September 1943, 650 men and officers, all volunteers, congregated in New Caledonia to form a special infantry battalion. They had been selected from the 37th, 43d, 25th, and Americal Divisions. Later, 250 additional men and officers arrived, from the 32d and 41st Divisions and from the 98th Pack Artillery, from Australia. Most of these men had been overseas for more than a year and had seen action in the South Pacific or Southwest Pacific Areas. These men made up the 3d Battalion of what was to become the 5307th Composite Unit (Provisional). They traveled to India on a transport with a battalion from the United States, which was to become the 1st Battalion of this Unit, and a battalion from the Caribbean area which was to become the 2d Battalion. These three battalions, organized as an infantry regiment, trained in India from November 1943 to January 1944. During this time, there were many transfers of men within the battalions, and about 150 replacements arrived from casual units. The 31st Quartermaster Pack Troop was also absorbed by the regiment. On 1 January 1944, the three battalions were formally activated as the 5307th Composite Unit (Provisional). The 31st and 33d Quartermaster Pack Troops, a detachment of the 835th Signal Service Battalion, and a platoon of the 502d Military Police Battalion were added to the unit early in January 1944. The 31st Quartermaster Pack Troop came into the theater from the Zone of Interior on 6 Jan. 1944, aboard the animal transport Samuel H. Walker which departed New Orleans Port of Embarkation, 14 Oct. 1943, with 329 mules and 26 horses. The 33d Quartermaster Pack Troop came into the theater during December 1943, but its animal transport, Jose Navarro, departing New Orleans Port of Embarkation with 330 mules and 28 horses, was sunk en route (26 Dec. 1944). Each shipment was accompanied by a transport veterinary detachment. 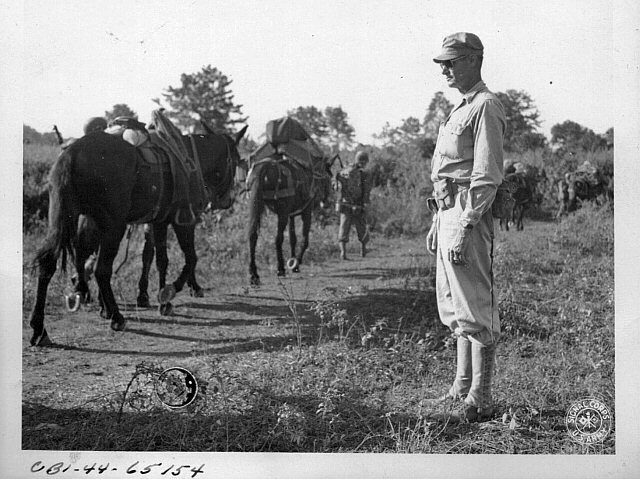 For the campaign in North Burma, the latter pack troop was remounted with horses newly arrived from New Caledonia. Lineage: 26 Jul 44 activated in Burma and assigned to the Northern Combat Area Command and composed of 124th Calvary Regt, 475th Infantry Regt, Chinese 1st Separate Regt, and 612th and 613th Field Artillery Battalions; also known as MARS Task Force; assembled near Mong Wi Burma and attacked the Burma Road in the Namhpakka area commencing 17 Jan 45; fought at Loi-kang Ridge and seized the Hpa-pen area heights on 2 Feb 45; moved to China by air in echelon 14 Mar-14 May 45 where inactivated in late May 45. Lineage: 18 Nov 40 inducted into federal service at Houston Tex as the 124th Cavalry Regiment (Horse) and moved to Ft Bliss Tex 28 Nov 40 under the 56th Cavalry Brigade; sent to Ft Brown Tex 5 Feb 41 and returned to Ft Bliss Tex 29 May 41; participated in the Louisiana Maneuvers 12 Aug-2 Oct 41 and then went to Ft Brown Tex 4 Oct 41; served at Ft D.A. Russell Tex 4 Nov-22 Dec 43 and returned to Ft Brown Tex; transferred to Ft Riley Kans 12 May 44 under Fourth Army; staged at Cp Anza Calif 10 Jul 44 until departed Los Angeles P/E 25 Jul 44; arrived India 26 Aug 44 where redesignated and reorganized as the 124th Cavalry Regiment (Special) 20-25 Sep 44; flown to Myitkyina Burma and entered combat as part of the MARS Task Force in Oct 44; established roadblocks on the Burma Road during drive to reopen the route below Nankam Burma; regiment moved over 300 miles in enemy territory relying on airdrop alone to establish a roadblock at Nampakka Burma; contacted the Japanese 15 Jan 45 and moved south along the Burma Road to arrive at Lashio Burma by 23 Mar 45; flown to China 26 Apr-14 May 45 where inactivated on 1 Jul 45 at Kunming, China. Distinctive Unit Insignia Description: A Gold color metal and enamel device 1 1/2 inches (3.81 cm) in height consisting of a shield blazoned: Per bend Or and Sable, a lion sejant of the last grasping the astronomical symbol for Mars Vert. Attached above on a wreath of the colors Or and Sable, a mullet Argent encircled by a garland of live oak and olive Proper. Attached below and to the sides of the shield a Gold scroll turned Green inscribed "GOLPEO RAPIDAMENTE" in Black letters. Symbolism: The lion and the symbol for Mars commemorate the Regiment's service in World War II in the Central Burma and India-Burma campaigns. The lion is taken from the seal of Burma. The astronomical symbol for Mars, protector of soldiers, refers to the Mars Task Force with which the organization fought in World War II. The crest is the seal of Texas, the "Lone Star State." The motto translates to "I Strike Quickly." 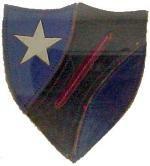 Background: The distinctive unit insignia was originally approved for the 124th Cavalry Regiment on 6 April 1935. It was redesignated for the 124th Mechanized Cavalry Reconnaissance Squadron on 29 August 1949. It was redesignated for the 124th Cavalry Regiment and amended to add the crest and symbol for World War II service (lion grasping the astronomical symbol for Mars) on 5 January 1967. Shield: Per bend Or and Sable, a lion sejant of the last grasping the astronomical symbol for Mars Vert. The lion and the symbol for Mars commemorate the Regiment's service in World War II in the Central Burma and India-Burma campaigns. The lion is taken from the seal of Burma. The astronomical symbol for Mars, protector of soldiers, refers to the Mars Task Force with which the organization fought in World War II. Crest: The crest is that of the regiments and separate battalions of the Texas Army National Guard: On a wreath of the colors Or and Sable, a mullet Argent encircled by a garland of live oak and olive Proper. Motto: GOLPEO RAPIDAMENTE (I Strike Quickly). Background: The coat of arms was originally approved for the 124th Cavalry Regiment on 15 April 1935. It was redesignated for the 124th Mechanized Cavalry Reconnaissance Squadron on 29 August 1949. The insignia was redesignated for the 124th Cavalry Regiment and amended to add a symbol for World War II service (lion grasping the astronomical symbol for Mars) on 5 January 1967. Current Assignment: 1st Squadron, 124th Armored Cavalry is organic to the 36th Infantry Division (2004) with units in Waco, Corsicana, and Athens. Lineage: 10 Aug 44 activated at Ledo India from personnel of the 5307th Composite Unit, Provisional, and assigned to the Northern Combat Area Command and further to the 5332nd Brigade, Provisional, also known as MARS Task Force; opened offensive 15 Oct 44 to clear northern Burma and open a supply route to China and on 15 Nov 44 began march from Cp Landis to assist the Chinese 22nd Div near Si-u; ordered to relieve the Chinese 22nd Div in the Mo-hlang area on 6 Dec 44; counterattacked to restore positions there on 9 Dec 44 and began holding action in the Mo-hlaing/Tonk-wa Burma area the following day, less 1st Bn sent to Shwegu vicinity; repelled strong Japanese counterattacks 13-14 Dec 44 and on the latter date made contact with the British 36th Div at Katha; relieved at Tonk-wa on 31 Dec 44 and marched toward Mong Wi where attacked from commencing 8 Jan 45; fought the Battle for Loi-kang Ridge 3-4 Feb 45 and entered China in Apr 45; inactivated in China on 1 Jul 45. 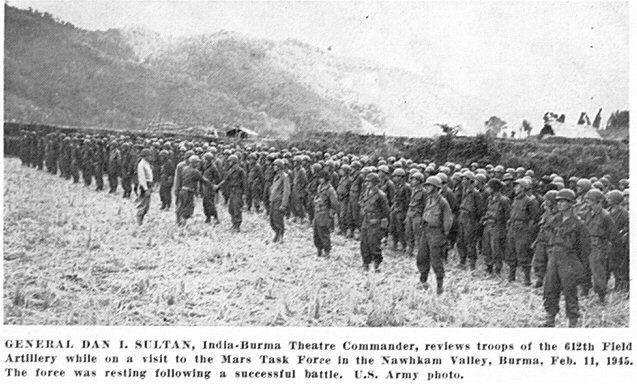 Organized in October, 1943, in the China-Burma-India Theater as the 5307th Composite Unit (Provisional). This group of volunteers specialized in jungle fighting along the Ledo Road in Burma. Its first commander was Brig. Gen. Frank D. Merrill, reflected in the regiment's nickname. 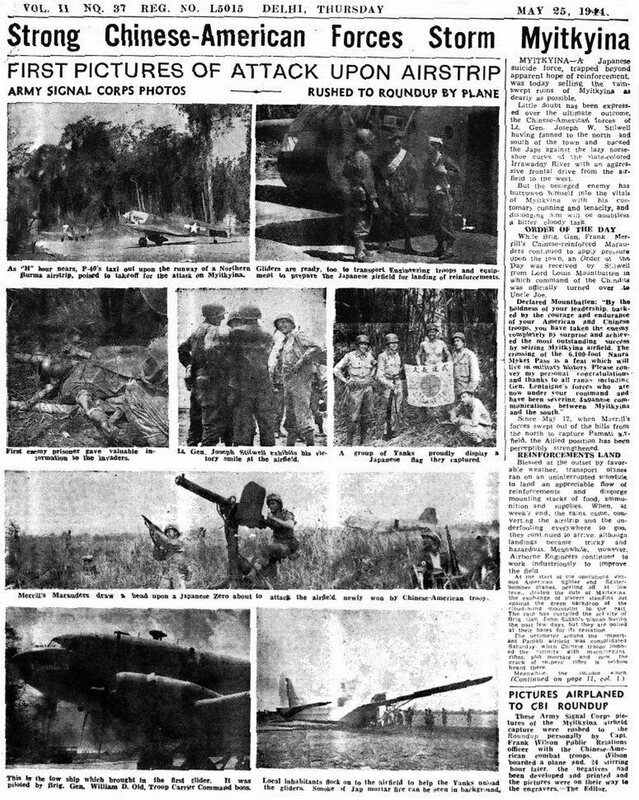 The 5307th participated in successful engagements in the Hukawng and Mogaung valleys of North Burma, March-April, 1944, and received the Presidential Unit Citation for the seizure of the airfield at Myitkyina in May. Consolidated in August, 1944, with 475th Infantry, the consolidated unit designated as the 475th Infantry. Awarded the India-Burma and Central Burma campaign streamers and inactivated in July, 1945, in China. Redesigned in June, 1954, as the 75th Infantry, activated in November on Okinawa and assigned to the 75th Regimental Combat Team. Inactivated in March, 1956, on Okinawa. During the Vietnam war, long-range reconnaissance patrols (LRRPs) were assigned to each field force, division and separate brigade. Existing infantry unit members were used in forming these units until 1 January, 1969, when the 75th Infantry was added to CARS and became the parent organization for all regular Army LRRP units. Cos. C through I and K through P were formed for Vietnam. Together, these elements of the 75th Infantry earned eight Vietnam campaign streamers, six Valorous Unit Awards and two Meritorious Unit Commendations. The last element of the 75th serving in Vietnam left the country in August, 1972. The 1st and 2nd battalions, 75th Infantry, are currently serving at Ft. Stewart, Ga., and Ft. Lewis, Wash., respectively. Both are assigned to Forces Command as Ranger units and both took part in the invasion of Grenada, October, 1983. While the colors are part of the Army Regimental System, the 75th will not have a home base and linked battalions overseas - duty with the 75th will be considered "extra-regimental." Organized 3 October 1943 in the Army of the United States in the China-Burma-India Theater of Operations as the 5307th Composite Unit (Provisional). Consolidated 10 August 1944 with the 475th Infantry (constituted 25 May 1944 in the Army of the United States) and consolidated unit designated as the 475th Infantry. Consolidated 3 February 1986 with the former 1st Ranger Infantry Battalion, 2d Infantry Battalion, and 3d, 4th, 5th, and 6th Ranger Infantry Battalions (see ANNEXES 1-6) and consolidated unit redesignated as the 75th Ranger Regiment; concurrently withdrawn from the Combat Arms Regimental System and reorganized under the United States Army Regimental System. "...the American contingent derived most of its personnel from a regular U.S. Army unit, the 527th Ordnance Company (Heavy Maintenance) (Tank). Brown (U.S. Army Col. Rothwell H. Brown, Commander, 1st PTG) wanted a unit like the 527th because of the tactical need and its unusual ability to all perform all maintenance in the field. Back in the U.S. the 527th had been raised from North Carolina state highway road crews, and trained with the III Armored Corps. During most of its tour in the CBI, the 527th Ordnance was commanded by Capt. Tom A. Miller, who was replaced on June 22, 1945 by Capt. John W. Hutchinson. The 527th had reached the CBI by a lengthy route via Oran, North Africa and Calcutta, India." 21 Jan 43: Hq and Hq Det, CT&CC act Ramgarh, Bihar, India, under USAF CBI as a pool for U.S. officers and enlisted men. 29 Apr 43: Y-Force Opns Staff (Y-FOS) activated to train, organize ,and equip Chinese divisions in Y-Force (see R/E for Y-FOS). Personnel for Y-FOS was drawn from CT&CC, but Y-FOS was directly subordinate to USAF CBI. 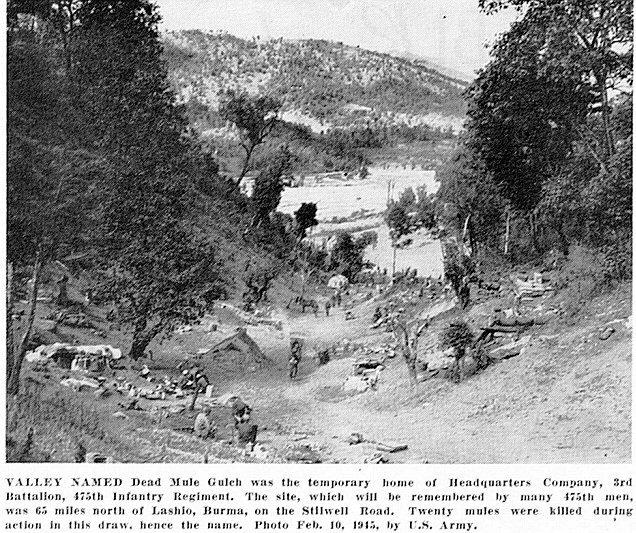 15 Jun 44: Burma Road Engrs Det formed as subsection of CT&CC and attached to SOS CBI. When USAF CBI was abolished and USF CT established, a portion of CT&CC CBI was within the geographical limits of China Theater. From this organization Y-and Z-FOS commands were allotted their personnel. 17 Nov 44: Y- and Z-FOS disbanded. That portion of the CT&CC CBI within geographical limits of CT was redesignated CT&CC CT with HQ in Kunming. Personnel of Y-and Z-FOS reverted to their original assignment in the CT&CC. 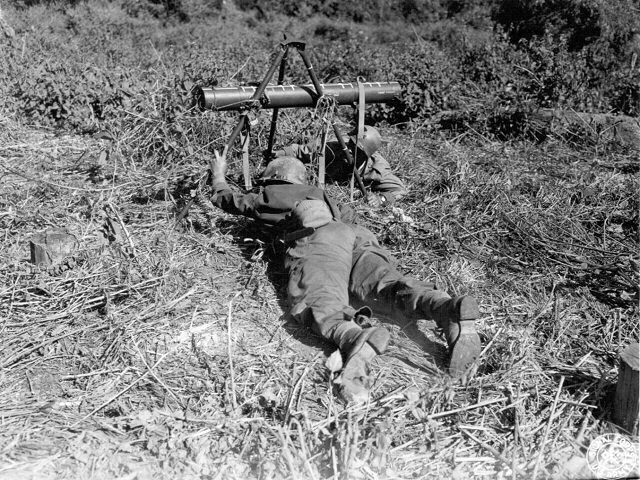 2 Dec 44: Mission of CT&CC CT was to render staff assistance and battle liaison to Chinese armies south of Yangtze River; to assist in training of Chinese Armies involved in plan for defense of Kunming area; to increase the combat effectiveness of Chinese armies. 8 Jan 45: CT&CC CT was split into two separate and component parts: Chinese Combat Comd (Prov) and Chinese Tng Comd (Prov) (CCC (Prov) and CTC (Prov)). In effect, CT&CC CT became a paper organization and the Commanding Officers of CCC (Prov) and CTC (Prov) reported directly to CG USF CT. The Chinese Training and Combat Command, China Theater was activated in November 1944, shortly after the China-Burma-India Theater was divided. It concluded the work of the Y-Force and Z-Force Operations Staff, which had been responsible for providing American training and supply to Chinese divisions. The new command took over the training programs at the Yunnan and the Kweilin Training Centers and continued to assist the Chinese Expeditionary Force in its offensive in central and southern China. In January 1945, the Command was organized in two subordinate administrative commands, the Chinese Training Command (Provisional) and the Chinese Combat Command (Provisional). Under the Chinese Combat Command were six subordinate commands for liaison with the Chinese Army Groups and a liaison team for each Chinese Army or Division. These organizations exercised no tactical or operational control over the Chinese commands. and the addition of "GSS" and crossed bamboo behind the star. 8 Jan 45: CCC (Prov) org Kunming as a component part of CT&CC CT (which became a paper orgn). CO of CCC (Prov) reported directly to CG USF CT. Mission of CCC (Prov) was to advise and assist the staffs of the Chinese units to which its pers were atchd in planning for and execution of tac opns and tng. Boundaries of command comprised all of unoccupied China -west to China-Burma border, south to French Indochina border, and east to Japanese-occupied areas. 29 Jan 45: Following subareas of CCC (Prov) established: Eastern, Central, Kwangsi, Southern, Western, and Res Comds. 10 Jun 45: CCC (Prov) ordered to prepare detailed schedule of mvmt of Chinese forces into Nanning - Liuchow - Kweilin staging area. 27 Jul 45: Boundaries of CCC (Prov) defined as combat zone of China Theater, lying to south of a line defined by north and east boundary of 6th War Area to its junction with Yangtze River, then east along the Yangtze; the Yangtze River inclusive was within the CCC (Prov) boundaries. 8 Jan 45: CTC (Prov) org Kunming as a component part of CT&CC CT (which became a paper orgn). CO of CTC (Prov) reported directly to CG USF CT. Mission of CTC (Prov) was to develop a systematized school program for Chinese trps, in order to increase their combat effectiveness. 26 Jan 45: CTC (Prov) act. It undertook contl of Fld Arty Tng Cen, Comd and Gen Staff School, and Chinese Ordnance Training Cen, which were already in existence. Y-FOS was est at Kunming, China, 29 April 1943 by verbal orders of the theater comdr. The staff was to work in liaison with the staff of the Chinese Y-Force. (The Y-Force consisted of Chinese trps in Yunnan Prov that were to make 30 divs to be used for combat operations against the Japanese.) Y-FOS was charged with the mission of tng, org, and supplying the Chinese Y-Force; est priorities for the air mvmt of supplies and equipment for the Chinese; supervising the Inf Tng Ctr and the Fld Arty Tng Ctr at Kunming; and formulating plans for the opns and supply of the Chinese Y-Force. 18 Jun 43: Activation of Y-F0S confirmed by verbal orders. 23 Jun 43: Eastern sec SOS became G-4 Sec of Y-FOS. Y-FOS charged with responsibility for rehabilitation of Burma Road. 24 Oct 44: Y-FOS asgd to CT.
17 Nov 44: Y- and Z-FOS disbanded. That portion of the CT&CC CBI within geographical limits of CT was redesig CT&CC CT with hq in Kunming. Pers of Y-and Z-FOS reverted to their original asgmt in the CT&CC. 1 Jan 44: Z-FOS act Chungking as a subordinate Comd of Fwd Ech Eq USAF CBI to train and equip a second 30 Chinese divs (known as Z-Force) for opns in East China. 24 Oct 44: Z-FOS asgd USF CT.
1 Nov 43: 5315th Inf Tng Cen (Prov), an American orgn, act Kweilin as subordinate comd of Rear Ech Hq USAF CBI to train officers and enlisted men of Chinese Army in East China. 1 Jan 44: Z-Force Opns Staff (Z-FOS) act and directed to supervise 5315th ITC (Prov) at Kweilin. 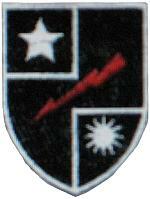 25 Jul 44: 5315th Inf Tng Cen (Prov) disbanded. 26 Aug 42: RTC formally activated. 24 Oct 44: RTC came under control of USF IBT with dissolution of USAF CBI. 15 May 43: RTC discontinued. "In May 1942, he [Stillwell] had looked at the 9,000 Chinese soldiers who had retreated from Burma into India and seen the nucleus of a force that could play an important role in a campaign to retake northern Burma. Overcoming British doubts, resistance from the government of India, and Chiang K'ai-shek's reluctance, he had obtained agreement to equip and train not only those 9,000 troops but 23,000 more soldiers that were to be flown in from China. A former camp for Italian prisoners of war located northwest of Calcutta at Ramgarh was selected as the training site, and on 26 August 1942, the Ramgarh Training Center was activated. On 20 October, the first of the Chinese soldiers to be sent from China arrived in India. The first goal was to train two complete divisions, the 22d and the 38th. Later, the training program was expanded to include another division, the 30th, and the Chinese 1st Provisional Tank Group, commanded by Colonel Rothwell H. Brown of the U.S. Army." (1) All lettering and boundary outlines In gold. (2) Pin is complete with screw fastener and nut. In Boyd Sinclair's Book Nine, "Confusion Beyond Imagination", page 204, the Ramgarh Training Center Service Pin, Casual Detachment 8925-B, is described. However, a picture of the pin is not presented. In my travels since the war, I have never seen this pin, either worn or displayed, and would guess there are many of us out there who are unfamiliar with the pin. Therefore, I have made a sketch and taken a picture of the pin for information. The description of the pin, as taken from Boyd Sinclair's Book Nine, "Confusion Beyond Imagination", is presented below for the readers information. "The men who began the Ramgarh Training Center, Casual Detachment 8925-B, got their own special symbol approved by General Stilwell. Former Technical Sergeant Rex "Brushmush" Smith of Irving, Texas, described it 30 years after the war. 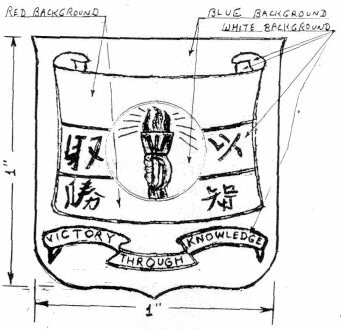 The detachment wanted an insignia that signified what it was trying to accomplish, teaching and learning. The designers came up with a scroll, torch, and hand in a circle, with points of the compass signifying that men of the detachment came from all parts of the United States. The scroll was divided into three sections, with one of the three primary colors in each to signify that men of the detachment came from all branches of the service. Below the scroll, the designers placed a banner with the motto, "Victory Through Knowledge." Chinese characters repeating "Victory Through Knowledge" adorned two sections of the scroll. Frank Dorn approved the design with a minor change, and Capt. Carl Arnold, serving as morale officer at Ramgarh, made arrangements for manufacture of the insignia in Calcutta, 180 miles to the southeast. Ramgarh next presented one to Vinegar Joe the next time he came through. Stilwell, according to Smith, granted permission for the Ramgarh men to wear the insignia only on their caps." 23 Oct 42: Hq Chinese Army in India (Chin Hui Pu) act under comd of Gen Stilwell. Function was to handle admin, discipline, and supply of Chinese trps in Ramgarh Training Center, while the American staff of of RTC handled, the equipping and tng of the Chinese trps. Apr 43 - Apr 44: During this period most of CAI shifted from Ramgarh to the North Burma front. When combat trps were moved to Assam, Fwd Ech Chin Hui Pu was est at 5 mile mark along Ledo Road. Ramgarh hq was desigd Rear Ech Chin Hui Pu. 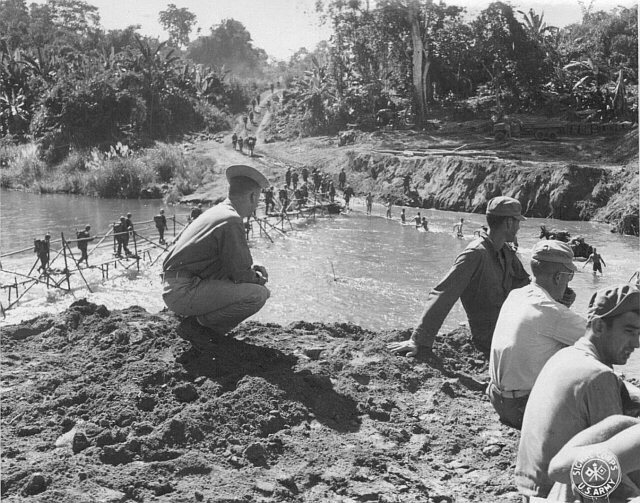 30 Nov 44: Supreme Comdr CT formally placed all Chinese forces in India and Burma (including CAI forces) under over-all comd of SACSEA. 1 Feb 44: Comd of all combat units in Assam-North Burma territory (NCAC area) was under Gen Stilwell in his capacity as CG CAI. Thus there were two separate orgns, CAI and NCAC, with the sane staff, and later the same CG (Stilwell), functioning under the over-all comd of SEAC in the same area. NCAC had a service mission and CAI had a combat mission. In the summer of 1944 the two orgns became one for opns. In the fall of 1944 it became the practice to refer to combat forces in this area as NCAC forces; though technically the two orgns were separate. O/a 5 Feb 44: 5307th Comp Unit (Prov) was atchd to CAI. 12 Nov 44: Allied Land Forces, SEA (ALFSEA) was est as subcomd of SEAC and it was agreed to place CAI under opnl contl of ALFSEA. 16 Dec 44: Rear Ech CAI moved to Ledo. A sub-Rear Ech remained at Ramgarh. Primary mission: To instruct and train officers and enlisted men for duty with antiaircraft artillery and barrage balloon units, and to activate, organize, equip, and train efficiently such units for combat service. Commanders: Maj. Gen. Joseph A. Green, 9 March 1942-27 October 1944. Brig. Gen. Frank C. McConnell, 28 October 1944-10 February 1945. Maj. Gen. George R. Meyer, 11 February 1945-8 October 1945. Chronology of events: Activated 9 March 1942 per AG 320.2/2 AGF (3-7-42) 9 March 1942. Headquarters at Washington, D. C. Headquarters moved to Richmond, Va. 23 March 1942 and to Fort Bliss, Tex. 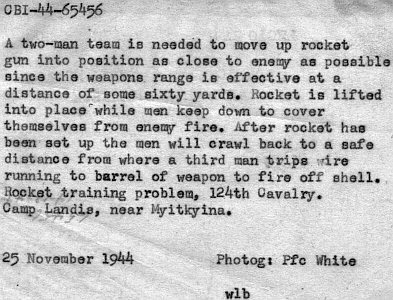 13 October 1944. Discontinued 30 October 1945 per General Orders 51, Hq, AA Cmd., Fort Bliss, Tex., dated 26 October 1945. Lineage: Redesignated 10 Sep 43 from 69th Coastal Artillery Regiment at San Diego, CA and moved to Ft. Bliss, TX 6 Mar 44; arrived at Camp Polk, LA 12 Jun 44 and departed Seattle Port of Embarkation 13 Jan 45; arrived in Honolulu, Hawaii 20 Jan 45 and sent to Saipan where arrived 12 Feb 45 and relieved the 24th Infantry Regiment in mopping up Japanese forces there 28 Jun - 1 Aug 45; inactivated on Saipan 5 Jun 46. Lineage: Activated at Ft. Kamehameha, Hawaii and departed 7 Jun 44; landed on Saipan 27 Jun 44 and inactivated there 15 Jan 46. Lineage: Activated in Ledo, India 22 Jun 44 and disbanded in Burma 8 Jul 45. Lineage: Activated 10 May 43 at Camp Haan, CA as the 59th Coastal Artillery Brigade (AA) where redesignated AAA Brigade 28 May 43; moved to Hamilton Field, CA 2 Dec 43 and returned to Camp Haan, CA 19 Apr 44; transferred to Camp Beauregard, LA 11 Aug 44 and Ft. Bliss, TX 15 Nov 44; staged at Ft. Lawton,WA 6 Jan 45 until departed Seattle Port of Embarkation 13 Jan 45; arrived in Hawaii 20 Jan 45 and departed 29 Jan 45; landed on Saipan 12 Feb 45 where inactivated 15 Jan 46. Lineage: Constituted 25 August 1943 in the Army of the United States as Headquarters and Headquarters Detachment, 16th Airborne Antiaircraft Battalion and assigned to the US Army Forces in the China-Burma-India Theater. Activated 22 June 1944 at Shingbwiyang, Burma. Disbanded 9 July 1945 at Myitkyina, North Burma. Lineage: Constituted 1 June 1944 in the Army of the United States as Headquarters and Headquarters Detachment, 17th Airborne Antiaircraft Battalion and assigned to the US Army Forces in the China-Burma-India Theater. 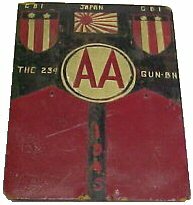 Activated 22 June 1944 at Moran Airfield, India. Disbanded 10 July 1945 at Dinjan, India. Lineage: Constituted 1 June 1944 in the Army of the United States as Headquarters and Headquarters Detachment, 18th Airborne Antiaircraft Battalion and assigned to the US Army Forces in the China-Burma-India Theater. Activated 22 June 1944 at Kurmitola, India. Arrived in Burma 16 January 1945 (ed: moved from Shwebo to Ondaw 1 Mar 45) and returned to India, 29 June 1945. Disbanded 9 July 1945 at Camp Kanchapara, India. Inactivated: 20 May 46, Guam. Locations: Hawaii 1943; Guam 10 Sep 44; Guam Aug 45. Lineage: May 42 OSS Detachment 101 arrived in India and stationed at New Delhi; recruited force from the Kachin hill tribe of north-central Burma residing in area where the Ledo Road was constructed and assaulted Ramree Island Burma on 27 Jan 45; assaulted Lawksawk Burma 9-13 Apr 45 and 11 May 45; assaulted Mongkung Burma 11 Apr 45 and assaulted Heshi Burma 23 Apr 45; assaulted both Indaw and Rangoon Burma on 2 May 45; OSS Detachment 101 discontinued on 12 Jul 45. Decorations: Distinguished Unit Citation, 8 May-15 Jun 45, WD GO 7-46.